Wilbert Kapinga is the managing partner of our Tanzania office. He specialises in corporate law, finance law, banking, privatisations, telecommunications and competition law. Wilbert has provided advisory services in numerous construction related projects including on roads, railways and airports. He has over 20 years’ experience advising domestic and international financial institutions and corporations on corporate, regulatory and transactional matters. Wilbert is a member of the Tanganyika Law Society, Law Association of Tanzania, East Africa Law Society, International Third World Legal Studies Association and African Society of International and Comparative Law. 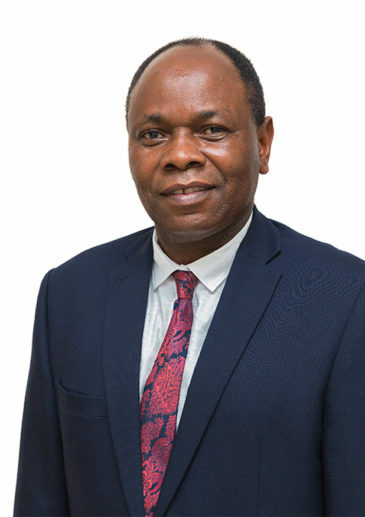 He is ranked Tier 1 in General Business Law by Chambers & Partners which cites him as being “highly praised by market commentators for his breadth of experience and strength in the market.” His expertise is affirmed also by Legal 500 and IFLR1000 who list him as a leading corporate lawyer in Tanzania. He has a Masters degree in Law from both the University of Dar es Salaam and Columbia University in New York, USA, as well as a Doctorate from Northeastern University in Boston, USA. The Governments of the Democratic Republic of Congo, Rwanda and Burundi (Communaute Economique des Pays des Grands Lacs Energie des Grands Lacs (CEGL)), together with Hunton and Williams LLP, in connection with the selection of private sector developers for the development of the Ruzzizi III, a 145MW hydro power project as part of the Independent Power Producer projects. The International Finance Corporation (IFC), together with Castalia Strategic Advisors, in connection with the identification of viable PPP projects, leading to a comprehensive report on PPP Project Identification and Development in Sub-Saharan Africa, East African Region. The Government of Tanzania on the legal and regulatory framework reform to support PPPs in Tanzania, which led to the enactment of the Public Private Partnership Act, 2010, and its Regulations. Pricewaterhouse Coopers on the legal and regulatory framework of Tanzania Zambia Railways Authority (TAZARA) as part of the TAZARA private sector partnership study. The sponsors of the Salama Waterfront Development project regarding the Tanzania law aspects of project financing, land acquisition, licensing and environmental regulation for the project. The Government of the United Republic of Tanzania on all legal aspects of the private finance initiative of an infrastructure project related to the Southern (Mtwara) Development Corridor. The World Bank and Dar es Salaam Water and Sewerage Authority on contractual and regulatory issues in relation to the Dar es Salaam Water Supply and Sanitation project. PRODECO Ltd on all legal aspects of the construction of a Private Finance Initiative (PFI) of the road and infrastructure project related to the Central Corridor (Road) Project and Southern (Mtwara) Development Corridors in respect of the Dar es Salaam, through Dodoma to Itigi roadway in Tanzania. The National Development Corporation (NDC) on the financing and development of the Southern Corridor Development Project through a private finance initiative and a Public/ Private Partnership (PFI) scheme. The Abraaj Group (Abraaj Investment Management Limited, Cayman Islands) in relation to conducting a legal due diligence on the Tanzanian subsidiary company (Doya Distribution Ltd) of Abraaj and issued a legal opinion on the status of the local company. This was ahead of a proposed investment which involved creating a special purpose vehicle to acquire 49.99% of Agathon Holdings (also referred to as Pearl Group of Companies) and entering into a shareholders’ agreement with Trendview Holdings in order to regulate their respective rights and obligations as shareholders in Agathon Holdings/Pearl. Minet (Mauritius) Holdings Ltd in relation to a transaction which involves the acquisition of shares in AON Tanzania, one of the biggest insurance brokers in the country. The transaction involves structuring for the recent amendments to local content requirements for brokers in Tanzania. Zhonghong Holding Co. Ltd in relation to the Tanzanian aspects of its acquisition of 90.5% of the issued shares of Abercrombie & Kent Group of Companies SA. (Estimated deal value: USD 412 million). As Tanzanian counsel to Carlyle Group in relation to its acquisition of a majority interest in AK Life Sciences, a manufacturer and seller of parenteral drugs and a distributor of pharmaceutical products, from Kiboko Holdings. As Tanzanian counsel to Capitalworks on its acquisition of the Tanzanian insurance broking business of AON plc. CDC Group Plc on instructions from Clifford Chance, in relation to the USD 180 million equity investment in Liquid Telecom, which will enable Liquid Telecom to expand broadband connectivity to some of the most underserved markets across Africa and support the continent’s thriving tech start-up ecosystem. This is the CDC’s first direct investment in an African telecoms company in over twenty years, and its largest single investment since it acquired the pan-African power company, Globeleq in early 2015. Rio Tinto Mining & Exploration Limited in relation to a proposed transaction with Strandline Resources Limited and its subsidiaries, Active Resources (T) Limited and Tanzanian Graphite (T) Limited. Onomo Hotels on potential acquisition of Holiday Inn Hotel. Several clients in anti-trust litigation before the Fair Competition Tribunal and the Court of Appeal in Tanzania. The Government of Tanzania (GoT), together with Freshfields Bruckhaus Deringer, in a bilateral investment treaty arbitration initiated by Biwater Gauff (Tanzania) Ltd (BGT) against the GoT regarding alleged expropriation of BGT’s investment in a water and sewerage infrastructure project of its subsidiary, City Water Services Ltd.
TANESCO, together with Hunton and Williams LLP, in a case initiated by Independent Power Tanzania Limited (IPTL) against the Government of Tanzania, in the Southern District of New York, for enforcement of a Government Guarantee for TANESCO’s performance of its obligations in a power purchase agreement with IPTL. The Government of Tanzania, together with Hunton and Williams LLP, on contractual regulatory and strategic matters relating to an Independent Power Project, including representing TANESCO in international arbitration proceedings regarding a high profile dispute pertaining to a 100MW power purchase agreement at the International Centre for Settlement of International Disputes (ICSID) in London. UBL Bank Tanzania Ltd on the establishment of a banking business in Tanzania, including all licensing requirements and ongoing compliance and regulatory advice. Diamond Trust Bank on the establishment of a banking business in Tanzania and all ongoing compliance and regulatory requirements. Bank M on the establishment of a banking business in Tanzania and all ongoing compliance and regulatory requirements. Equity Bank of Kenya and United Bank of Pakistan in the establishment of their banking business in Tanzania. Citibank Tanzania Ltd on all security documents in its custody, including the status of facility letters, loan term agreements, mortgages and debentures in accordance with the laws of Tanzania. Barclays Bank, Standard Chartered Bank, Stanbic Bank as well as domestic banks Eurafrican Bank and Exim Bank in conducting searches at registries such as the Companies Registry, Land Registry and the Registry of Documents and preparing security documents (including debenture, mortgages, guarantees and pledges) and in the registration of these security documents with the respective registries. Government of the United Republic of Tanzania through the Presidential Parastatal Sector Reform Commission (PSRC) in providing legal advisory services to the Bank of Tanzania and the PSRC on the re-organisation and restructuring of the National Bank of Commerce. The World Bank and the Bank of Tanzania with the implementation of Islamic banking laws and rules in the United Republic of Tanzania. HiTS Burundi on the legality of a proposed 510 million AED (approximately USD 140 million) Sukuk issued by the International Investment House Co. LLC. Chambers and Partners, 2018 ranked Wilbert in Band 1 for General Business Law and in Band 2 for General Business Law: Dispute Resolution. IFLR1000’s 2018 Financial and Corporate Guide rated Wilbert as a Highly Regarded Lawyer for Capital markets, Energy and infrastructure, Project development, Banking, Project finance and M&A. Chambers and Partners 2017 ranked Wilbert in Band 3 for Dispute Resolution. For more than a decade, Wilbert has consistently been ranked in Band 1 by international law directories such as IFLR 1000 and Chambers Global and has been described as the leading corporate lawyer in Tanzania. His work is also recognised by the International Who’s Who of Project Finance (2010 and 2011) and the International Who’s Who of Banking (2012).